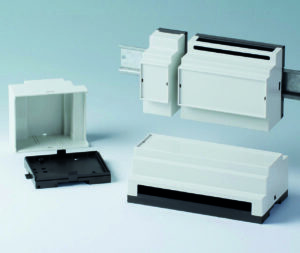 OKW has unveiled a new series of flat/high Railtec B DIN rail enclosures that accommodate connections at different levels and offer extra space. Targeted at machine-building and motor industry applications, Railtec B is a universal DIN rail enclosure that can be mounted on TH35 DIN rails or directly on walls for applications such as control equipment, especially lighting systems. Various versions are available for PCB terminal blocks, plug headers, front connectors and D-sub connectors. The new flat/high variant is available in two, four, six and nine modules, offering sizes from 35 by 86 by 58mm to 157 by 86 by 59mm. The enclosures are also fully insulated and protected to VBG 4.